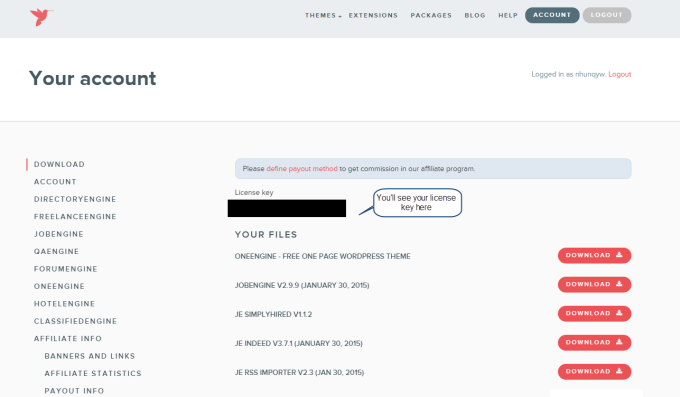 FreelanceEngine version X: this is the theme package, which is the main file you can use to set up your site. FreelanceEngine documentation: this file includes steps- by – steps guide to help you set up your site. You don’t have to upload it in your site. FreelanceEngine Sample data: this is the sample data including the default content similar to our demo site. You will use it when installing the theme, the video “Install the theme” will demonstrate how to use it. FreelanceEngine child theme: this is the additional package, you can use it if you want to customize the theme more. You can learn more about it here. FreelanceEngine PSD package: The name speaks itself, it’s the design of the theme, you don’t have to upload it.